Lately I can’t seem to get this image of a slouchy but structured, high-waisted pair of pants out of my mind, even though I can’t pinpoint where the idea came from. My image looks a little like this (left) from the SS10 Stella McCartney runway. In fact, they both give off the same sophisticated, effortlessly chic vibe. The long jacket, tucked in shirt and light-colored heels with these pants are definitely a good match! Especially the light colored heels. Darker colors/flats would make you look short and stumpy, given the awkward ankle length of the pants. After much research, I finally figured out what they’re called- pleated pants. It is the extra pleats on the pants that gives the hip part the oomph that gives you extra wiggle room and accentuates your figure. I tried on a beautiful pair the other day from Dries Van Noten, though they were a bit large for me even at size 2 (maybe the design runs big?). Regardless, it was out of my price range anyway. 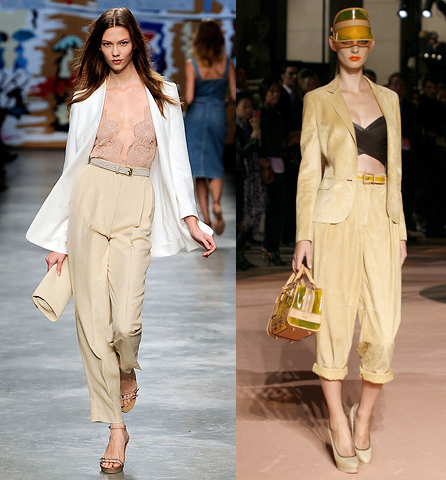 Luckily, I found a similar pair surprisingly from Elie Tahari (above). “Surprising” because I usually associate ET with more sophisticated work clothes- but I suppose these do qualify? They’re perfect, and I’m super tempted to put in my order. My only dilema is whether to get 0 or 2! Another pair I have my eye on, are these ones from Zara (I’m almost 90% sure that these pants (right) corresponds with the ones from the catalog (left)). Though does anyone else think that this color reminds them of the safari? I suppose I can go and try them on and see where it goes from there! By correspond, do you mean that you’re 90% sure that they’re the same pant? If so, that doesn’t seem to be the case, as the slacks on the left don’t have pleats, and the ones on the right have double belt loops. Chelsea: Good catch, thanks for pointing it out! I guess I jumped to the conclusion since the belts looked the same. Regardless, I think the look goes very well with pleated pants too!